The readers' votes are in on "Which Monrovia restaurant serves the best pizza?" 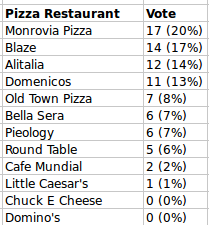 The winner is Monrovia Pizza (on Duarte Road at Mayflower), followed by Blaze, then Alitalia, and Domenicos. I know what sauce they use for their pizza because one time, I saw a truck come out from the Duarte Pizza Company and I wrote the name of the company down. I called them and I asked them can I buy some of your sauce and the place said sure. I bought one case. I want to go back soon to buy some more because it's been years since I bought it. When I win 4 out of 5 in the Fantasy 5, I will buy some more of those cans.